Many Oregon businesses and residents feel like state government meddles too much in their everyday lives. They also feel like all this meddling does not do much to make their day-to-day lives much better. New research shows they may be correct. 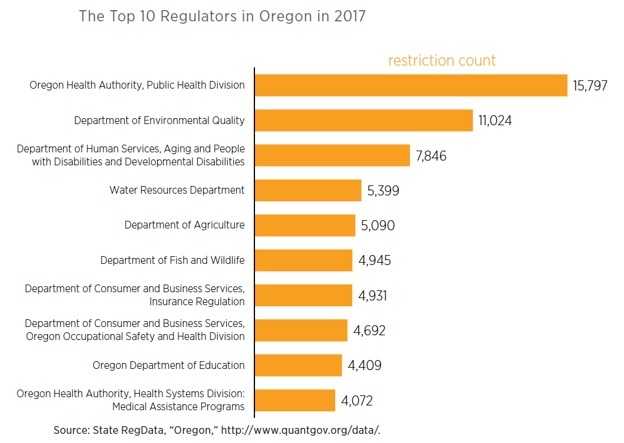 Oregon has the sixth highest number of regulatory restrictions in the country. State RegData is a database that measures state-level regulatory restrictions. The Mercatus Center has reviewed the database and counted the restrictions by state. Based on data analyzed so far, New York has the most regulatory restrictions in its administrative code, with more than 300,000 restrictions, while Arizona has the least, with fewer than 65,000 restrictions on the books. 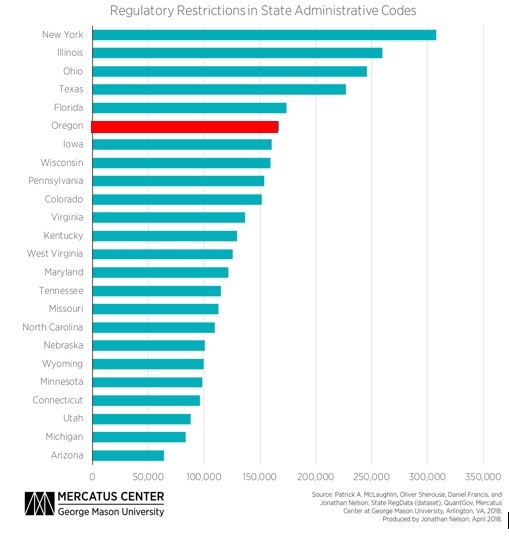 Oregon is sixth, with more than 167,000 restrictions. There are 168 agencies with chapters in the Oregon code. The figure below shows that in 2017, rules from the Oregon Health Authority, Public Health Division, which are found in chapter 333, contained over 15,000 restrictions. This makes it the biggest regulator in Oregon. Even with all these regulations—and a lot of spending—the United Health Foundation reports the state has one of the lowest childhood immunization rates, one of the highest rates of pertussis (whooping cough), and one of the biggest health disparities between those with and without a high school education.